Get grilling with Martha as she introduces exotic flavors to your next cookout. In this episode, learn four techniques for cooking four different recipes – all using the grill – Arabian Gulf-style fish in banana leaves, date-glazed lamb chops, sea bass fillets with okra kebabs, and spatchcocked saffron chicken. 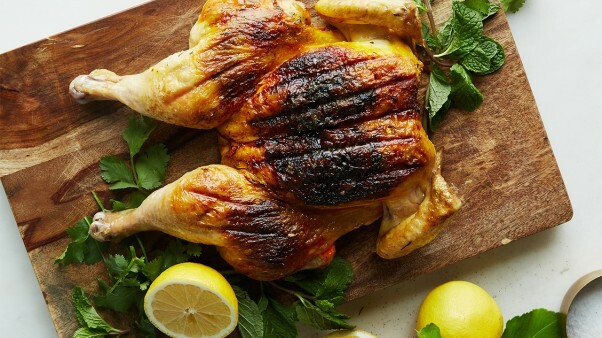 This spatchcocked saffron chicken recipe appears in the "Grilled Favorites" episode of Martha Stewart's Cooking School. Preheat oven to 350 degrees (177 degrees C) and heat a grill or grill pan over medium-high. Brush grill with oil to prevent sticking. Rub chicken with remaining 3 tablespoons ghee and season with remaining 1 teaspoon salt and 1/4 teaspoon saffron. Reduce heat to medium. Grill the chicken, skin-side down, for 20 minutes. For more even cooking, the chicken can be weighted with a foil-covered brick, if desired. Flip chicken and transfer to a rimmed baking sheet and cook until a theromometer inserted into the thickest part, without touching the bone, registers 165 degrees (74 degrees C), 20 to 25 minutes more.